(Blastitude no. 9)...It's interesting to hold [the 7" by Naoaki Miyamoto] up to the solo CD-R by Blastitude's own contributing partier Matt Silcock, also on Public Eyesore, which has a similar attack in places, but at 13 tracks and nearly 60 minutes, is maybe a little too much of a good thing. 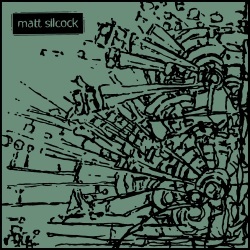 Still, if you're in the mood, a good thing it is, and to Silcock's credit, he breaks up the 'noise guitar' stuff with saxophone, acoustic guitar, and some other field recordings (including a woozy not-quite-prog bass/drums jam). A strangely langorous approach is taken too, which helps spread things out, though some of the noise guitar work can get in your face, especially the album closer, an over-the-top quasi-metal number called "Akira Takahashi Goes Home." For the most part, however, the album makes nice background-with-option-for-foreground music in the same way a solo improv record on Incus might.